Like with most people, Sundays are my lazy days. I still get up before everyone else in the house, but I use the quiet time to sort of reset for the week ahead. As with every morning, I start my day off with a cup of coffee (because I’d die without my cup-of-joe — don’t judge me, I’m a mom) and I browse the web to catch up on the blog articles I’ve been saving to read up till now. 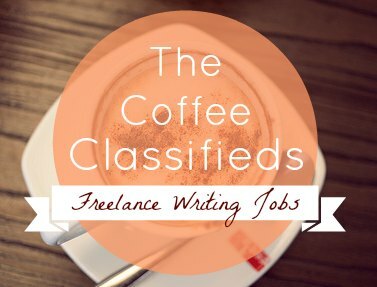 During one brainstorm session, I thought that it might be really cool to create a series of weekly posts that listed both the job posts from the previous week across some popular networks and some great articles from other sites that writers might like. Why? Because it just consolidates a lot of work for some people, and it gives you guys the chance to read some other great posts from the web. With that being said, welcome to the very first edition of The Coffee Classifieds! 5 Ways to Show Clients You’re a Rare Blogging Butterfly | Alicia writes about how to become that rare type of blogger that all serious companies want. Want people begging to work with you? Check out her tips. 3 Common Writing Myths and How One Writer Challenged Them | Saul is a freelance writer and shares his story of how he left some very common writing myths in the dust in order to become a successful writer. All newbie writers should read over his post. 27 WordPress Hacks Every Serious Blogger Needs to Know | Learning WordPress is an important part of blogging since many clients have their bloggers submit via the WordPress backend. These tips are second-hand nature to seasoned WordPress users, but anyone new to the platform can learn a lot from Kevan’s article. 15 Quick and Easy Productivity Super-Hacks for Busy Bloggers | This guest post on ProBlogger gives some nice tips for keeping up with a busy schedule. Formatting Internal Dialogue: Quotation Marks or Italics? | Have I mentioned how much I LOVE Mignon Fogarty? I love her tips and these tips are great too! This post series if the first of more to come, but I would love your feedback! Do you guys like these types of posts? If so, what would you like to see in them? Any suggestions? 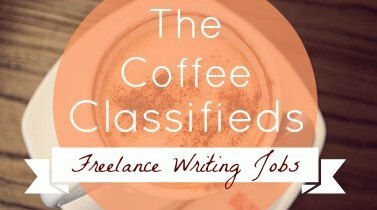 Also, anyone out there who would like to post there blogging job ads in The Coffee Classifieds for free? Be sure to shoot me an email. And finally, I’m looking to have a few guest posts on the blog in months to come (paid of course — yay!) and I’ll be adding a post soon with further details. I’m willing to work with some new writers, but I’d love some posts from long-time bloggers too. You guys can enquire further on my contact page, or just wait for the post.